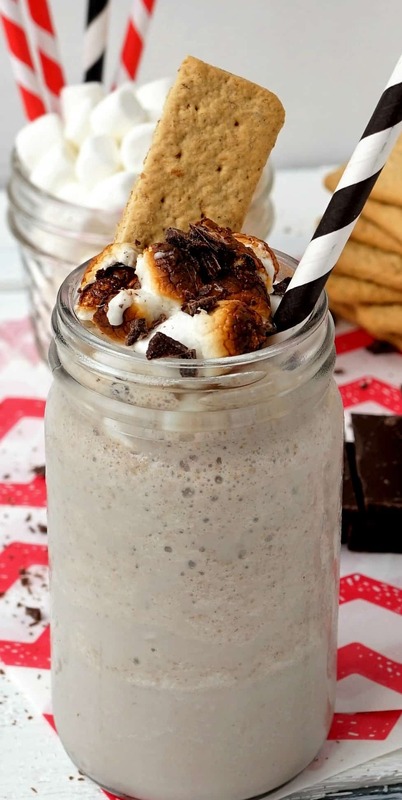 Toasted S’mores Milkshake: The answer to your campfire prayers! Disclosure: This post is part of a working relationship I have with The a2 Milk Company. As you know, I only work with companies I myself use, promote and love! Thanks for supporting the brands that keep this simple swapper swappin’! Gosh, nothing screams summer to me more than a campfire surrounded by friends, family and lots and lots of marshmallows! As a kid, we spent our summers in the motorhome, traveling up and down the California coast boating, camping and having the time of our lives! It’s funny because as I look back now, I wish I would have cherished those moments more. Sure, adulthood has its perks (enter those Blueberry Lemonade Chillers), but nothing is as carefree as a child eating a ooey, gooey messy s’more! So, in the spirit of summer, I teamed up with The a2 Milk Company to recreate that childhood classic in a form that all people could enjoy. There’s no need to start a fire for this one which bodes well for those in the dry, fire stricken areas of the nation (aka Southern California). 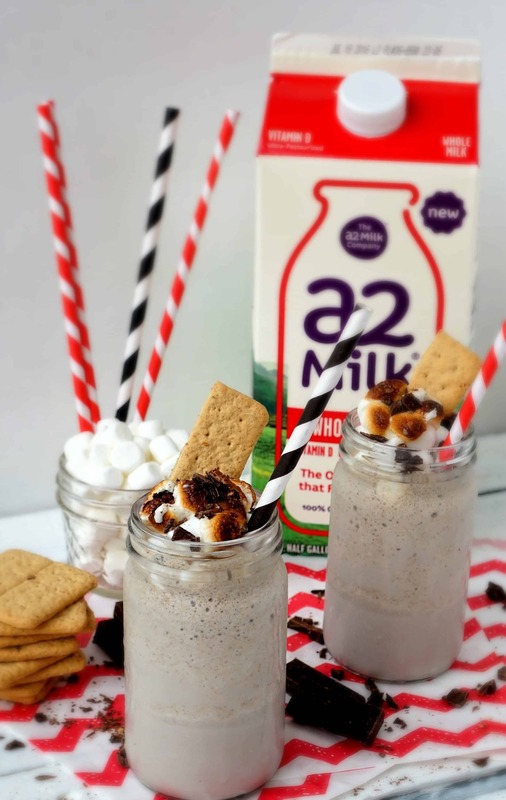 Plus, this Toasted S’mores Milkshake is filled with nutrition. I have to admit, I thought about amping up the fiber by adding black beans and sneaking some dried figs in for sweetness. But, rest assured, I thought twice before doing that! I imagined my dad, the farmers used to the rich Oberweis, and those true milkshake connoisseurs who would balk at the thought of me calling that a milkshake. Thus, I went back to the drawing board, focusing on the true components I couldn’t leave out to make this milkshake a winner. Enter ingredient number one, milk! Cows’ milk is a nutrient powerhouse, considered an excellent source of calcium, vitamin D and protein. Just one 8 oz cup delivers 11 grams of protein! Plus, it’s also got a hefty dose of minerals, like phosphorus, riboflavin, vitamin B12, potassium and vitamin A. Though a2 Milk® has a variety of options for you to choose from (whole, low fat, skim), I went with the whole milk! Yes, whole milk is what truly delivers that rich, creamy flavor to a classic milkshake. I picked up an idea from fellow blogger Real Mom Nutrition the other week when her 6th grader told her to freeze chocolate milk for a snack. Brilliant! A cup of whole milk when straight into my ice cube tray and into the freezer. I decided since I wasn’t going to sacrifice the whole milk, I could freeze it and use it in place of ice cream. Say what?! Yep! 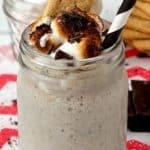 This Toasted S’mores Milkshake is free of ice cream! Once the milk was frozen, I used this as the base, added in a bit more of the liquid whole milk, a gluten free graham cracker, some cocoa powder and agave. Easy peasy… right? The beauty of this is that it’s also lactose friendly! Yep, for those people who think they have an intolerance to dairy, your troubles are solved with this milkshake. a2 Milk® contains only the A2 protein. Considering science shows that the A1 protein is what causes the digestive discomfort people experience, it’s amazing to know there’s an option out on the market for all people to enjoy milk again. And no, a2 Milk® does not have some sort of crazy chemist thing going on to make the cow have all A2 proteins! All cows naturally have a blend of A1/A2 proteins, or one or the other. The a2 Milk Company is simply hand-selecting those with only the A2 protein and putting them in their own VIC (very important cow) club! Pretty cool… huh?! 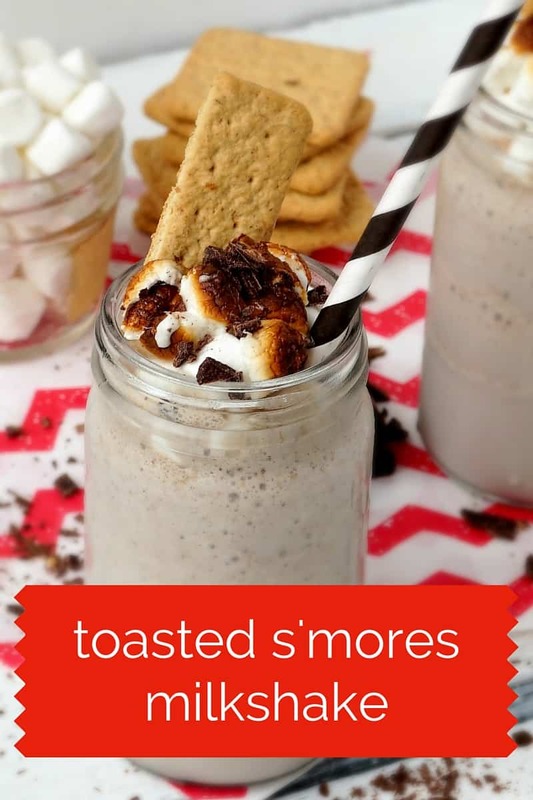 Now, sit back, relax, and dive into this Toasted S’mores Milkshake with me! 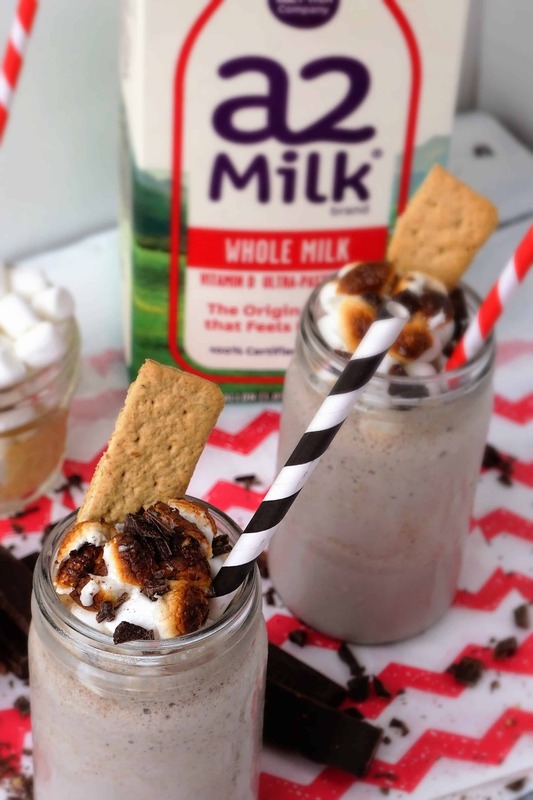 Enjoy the campfire taste brought into the comfort of your own home with this lactose friendly, gluten free Toasted S'mores Milkshake! Pour 1 cup of whole milk into an ice cube tray. Let freeze. When ready to eat, set oven to broil. On a greased cookie sheet, layer 3 tablespoons marshmallows. Broil for 1-2 minutes. Remove. In a blender, add entire 1 cup of whole milk ice cubes, 1/2 cup of liquid whole milk, 2 oz graham crackers (1 sheet), cocoa powder and agave. Pour milkshake into two glasses. Evenly distribute toasted marshmallows over the top. Sprinkle chocolate shavings and add one sliver of remaining graham cracker to top. Feel free to sub honey or 2 dates in place of agave. Gluten free graham crackers are recommend for GF diets only! Let’s chat! What’s your favorite milkshake? This looks absolutely amazing! I have to try it! Love that you used Sally’s son’s idea to freeze the milk to make the milkshake so you don;t have to use ice cream. I find all these new milks to be really interesting, especially since they are lactose free – A2 and Fairlife are two I’m thinking of. Thanks Jess for the compliment! Yes, I love that A2 milk gives people an option who used to be able not to drink milk. However, it has lactose! But, what’s interesting is that studies are finding people aren’t actually reacting to the lactose, but the protein component of the milk! It’s insane how much new info is developing since we were in school! 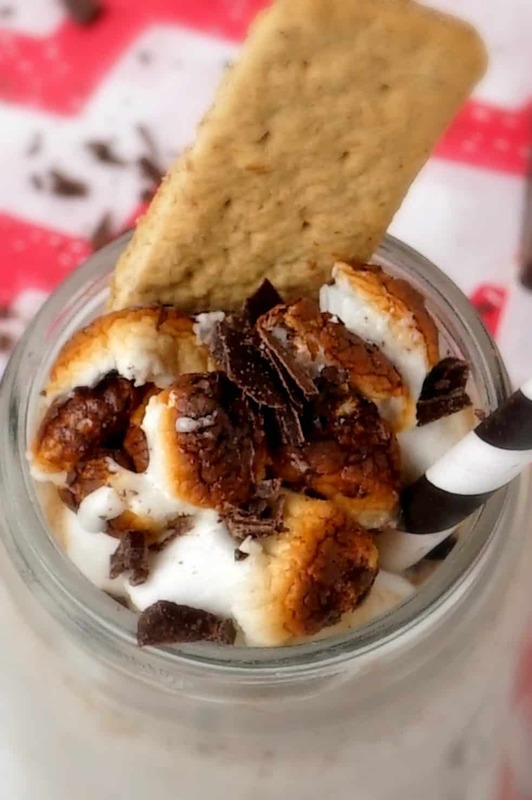 S’mores shakes are such a fun idea! I’ll have to try a version of this in our home. Absolutely! I hope you do! This looks so amazing! I’ve never thought to freeze milk for a milkshake….what a great idea! THanks Wendy, such a simple swap, right?! Seriously…sounds amazing Liz!! And the photos are beautiful! Aw, thanks Tara- that means a lot! HA, I’m glad I made you chuckle, I knew one RDN had to if they read this! Some things are better not messed with, right?